As you can see from my last installment here in the Ten Year Series, "place" has been very important to me in ten years of writing about beer. It's right up there with "people", which you'll see me spotlight in a few weeks. Before I get into this, allow me to explain the picture above. On the surface it may not scream "place", but as you can tell from my hair line/style it's from quite a few years ago. Still to this day it's one of my favorite beer pictures that captured the people, the place, the beer, and the spirit of the moment. 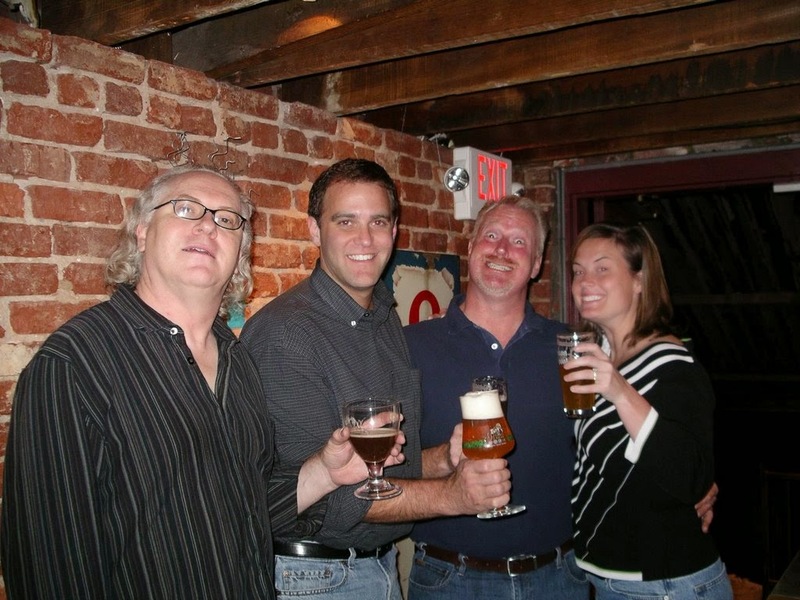 In addition to beer writer Bob Townsend from Atlanta (far left), there's a longtime college-era friend Kristen and her super-awesome brother-in-law Mike in the picture who since has passed way too soon from this earthly life. The picture was taken at the famed Brick Store Pub in Decatur, GA which remains a top ten personal beer spot for me in the US. Place. What does it matter? It's all about the beer, right? Nope, not in my book. Good beer — quality beer — is no doubt important to the experience. However, the building, the property, the people, the culture, and the surrounding region all play a role in our experiences as we enjoy our favorite beverage. It can even have the psychological power to change our taste and appreciation for a beer. A little over a year ago, I set off on what would become just shy of 10,000 miles around Delaware, Maryland, New Jersey, and Pennsylvania finding the best of the beer world at breweries, bars, and restaurants for "Beer Lover's Mid-Atlantic". It's due out (finally) this month, I promise, just in time for Philly Beer Week! Place has always been extremely important to me. Sometimes more important than the beer itself. Beer has taken me on the road exclusively to find it and drink it in its native habitat. Other times, beer has served as a pleasant distraction or addition to a meal while on a road trip for other non-beer reasons. Think about how a Maui CoCoNut Porter might taste just a little different HERE instead of THERE. Or how about a Tripel Van de Garre in suburban Philadelphia instead of a down a small walkway in Bruges. A fresh-near-the-source Kolsch in Cologne compared to months spent in transit to somewhere in the States. Urban vs. rural. Cold linoleum or rich textures. Mountains in the winter compared to the beach in summer. etc. Over the years, my journeys have found me drinking beers near an active volcano in Costa Rica, on the Rhine River in Germany, poolside at a Hawaiian resort, on a farm in Belgium, in the shadows of NASA in the National Air & Space Museum in DC, and under a windmill in Amsterdam. I've enjoyed the good stuff at taco stands and extravagant dinners and venues and events spanning the wide spectrum in between. As early as 7 in the morning and as late as, well, 7 in the morning. By rough count, I've tipped back this fine malted barley beverage in 38 states and 15 countries. Beyond that, I don't keep track of which beers or how many I've consumed. To date, my memory has done a pretty sufficient job of that for me. Plus, keeping an exact inventory and showing them off is not really my thing. Like I said, it's more often about the place, the people, and the experience and not always exclusively about the beer. I'm sure that last statement might confound a few of you. - Over at YouTube, my videos of the Lagunitas Skunk Train annual fundraiser have been fairly popular. It's still a personal Top 10 beer event of all time. - From Santa Cruz to Fort Bragg, I've covered quite a bit. There's been a lot of Russian River, amongst a whole bunch of other northern California goodness. - And the little Pliny the Younger contest that I ran; that was fun. - BreastFest that I covered in 2012....and again in 2013. - and, of course, three visits during SF Beer Week. 2009 was the first official year and here's a link to Part 3 (you can backpedal through parts 1 and 2 from there). 2011 was a very good year. 2013 was an even better year [link to Part 1 and link to Part 2]. - Blind Tiger has seen my mug quite a bit. Randomly spotting Brian O'Reilly there was a fun surprise. - I'll maintain until further notice that the best thing about LA is not in LA...it's in Santa Monica. The beachside activities, neighboring Venice Beach, Father's Office, and my habit...Library Ale House. I've shared quite a bit about these over the years in social-land of FB posts and Twittering Tweets. - Atlanta has a long way to go. It sprawls and definitely a lot of sociological issues to deal with. - But the dozens of times when in Atlanta over the years, the key has always been to get out of Atlanta, not far. But, to one of the more diverse areas around, Decatur. - It's always been Brick Store Pub, long before the raters came in and figured out that one of the country's top bars could really, truly be in the south. - And I caught up with some of the new stuff a few years ago when "Dr. Joel" and the New Holland team was entering Georgia. - Haven't seen enough of Boston as I would like, but a pretty good tour back in 2006 that took me back to one of my early beer experiences from the early '90s and a couple other visits that turned up some good stuff. Need to get back soon and explore the new scene that has taken root. - Went through quite a few years of visiting enough to learn about the better spots and see Texas emerge strongly onto the national conscience in terms of better beer. - Meddlesome Moth sticks out as one of the best. Ginger Man. Central Market. They're all discussed in that link. - There was an epic-like trip in 2008 that took me to Boulder, Fort Collins, Glenwood Springs, and then this little festival in Denver called GABF. - The best thing to losing some Philadelphia friends was that they moved to Madison. At the time seemed bizarre. But visiting a few times, quickly changed our minds. - They've taken us to Green Bay a couple of times for football and beer. And Madison is where they call home. There's the better known Capital, Great Dane, New Glarus, and others. We found The Old Fashioned and Ale Asylum brewery to be real local gems. - Would love to run the marathon there one year and then stay longer to explore the still-exploding beer scene. A real special place. - Ommegang. BCTC, it's a category unto itself. Been going there since it was a little tiny baby of a festival. A special one for sure, but small. - Now it's so much bigger, and so much more of much more. Doesn't make it bad. Just very successful and still quite well executed. - I could re-share any number of links, but use this one to get started. When you hit that link it leads off with one of my favorite pictures from tens of thousands that I've taken here at The Brew Lounge through the years. So many great memories come from this special brewery nestled in a beautiful part of the country that, oh yeah, just so happens to have some pretty darn good beer too. - What a great city. Underrated in many ways. Maybe you say you don't want to live there, but if you're into great beer, you sure as heck want to visit. - Fat Head's was my first introduction to the beer scene of the 'burgh; now they have a brewery too. Penn Brewery and Piper's Pub too. East End takes a special place high amongst the recommended stops on any well-studied beer travelers itinerary. - There are lots of bridges, only to be outnumbered by the number of breweries and great bars to drink in. - You probably know I like to run. And I like my beer. So the intersection of the two makes perfect sense for me to explore, right? - I've run in the Philly, NYC, Pittsburgh, Harrisburg, and Marine Corps Marathons. I also happened to write a Beer Guide for each of them, except Harrisburg. - For Harrisburg, it's simple. Just head over to Hershey afterward for a great meal and rehydration at Troegs! - New York City Marathon. - Marine Corps Marathon in DC. Where have I come up short and what do I still need to see? And it all comes back at the end of the session to my home Philly turf. Philly Beer Week was launched in 2008 and spawned hundreds of others across the country. But, very few compare.